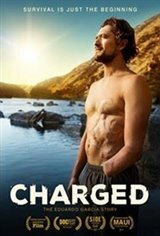 CHARGED chronicles the life-changing journey of chef and outdoorsman Eduardo Garcia after he is shocked by 2400 volts of electricity in a freak accident while hiking in the remote backcountry of Montana. Eduardo lost his hand, ribs, muscle mass, and nearly his life, but more important than what he lost is what he found. Through sheer resilience, he reclaims his life, helped by his former partner, Jennifer Jane, who nurses Eduardo back to health. He learns to embrace his past, his family, and his future. A survival and love story unlike any other, CHARGED tells Eduardo's remarkable journey from getting up off the forest floor to becoming the man he is today.